One of the things All Forces addressed was the DRM vs Bit Torrent downloads. Apple has come a long way since 2005 with their music, having the majority of the catalogue as “iTunes Plus”. This has their musical offerings in 256Kbps DRM free AAC audio. It’s an advancement since 2005, even though others offer better music quality. There are still DRM restrictions in place for video, and I don’t see this abating any time soon. The TV and Movie industry is a lot less lenient to the removal of Digital Rights Management, and with Blu-ray winning the HD wars we wont see DRM removed from video any time soon. One of the key points in the review by All Forces in 2005 was the low resolution of the iTunes video files. Quality of the TV episodes have increased since 2005, and Apple seem to be on a winner with H264 encoding. The files for The Tudors video files are 640×360 H264 encoded MPEG4 files, with an average size of 600MBytes per episode. In 2011 I also use an Apple TV. Pricing is a MAJOR sticking point with people using iTunes for TV Shows. In Australia they sell at AUD$2.99, only in standard definition, and only via the iTunes Store. In the US one can purchase HD versions for the same price or SD versions for USD$1.99. It’s ridiculous. You can’t even watch TV shows in Australia on Apple TV. Why?! 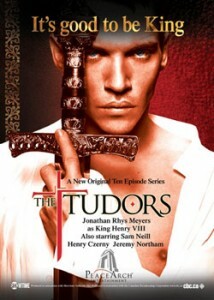 The quality of the iTunes show, as seen with The Tudors Season 1 is great. Apple have come a long way over the last 4 years to be able to offer all major TV shows as electronic downloads. Ease of access, and a decent price point makes it viable for consumers to use Apple as their source of entertainment. However, the disparate pricing across markets and the lack of HD shows in some countries is the final blocker to making iTunes your first and only stop for watching TV shows. Yeah I downloaded a season of the same show … and I have to say the quality is lacking … well below a DVD in my opinion. For all Apples other products, they claim it’s shipping costs etc. that put the price up. But on digital items? The truth is that they put the price up in Australia simply because they can. Same with cars, same with electronics and other imports into Australia, the price increase is well beyond taxes and shipping costs… they’re just padding their profit margins. Manufacturers put their prices up across the board, simply because they can. It’s price fixing, it’s cartel behaviour, but who cares? Not the politicians, not the so-called consumer watchdogs. Purchase off the internet where you can, pirate if you can’t. Playing fair is one thing — getting shafted is another. Don’t let them do it.